Krill oil is a natural source of omega-3s delivering essential nutrients to the body. However, Superba KrillTM oil is much more than that. It comes with choline, phospholipids, astaxanthin, and a unique story. Studies have shown that krill oil preferentially boosts omega-3 levels compared to fish oil (1,2). This occurs in spite of it having lesser amounts of omega-3s EPA (eicosapentaenoic acid) and DHA (docosahexaenoic acid) as measured on a gram to gram basis. A reason for this is because of the phospholipid-bound omega-3s that krill oil delivers. They have the ability to carry omega-3s EPA and DHA in a more efficient way than omega-3s bound with triglycerides. More specifically they deliver omega-3s to the blood, tissues, and the areas that need them the most. On top of that, krill oil also provides the nutrient choline – an essential nutrient – which holds a wide range of roles in the human metabolism. This is crucial for cell structure, functioning, and signaling. Choline also contributes to cardiovascular, hepatic and cognitive health. Krill oil also naturally delivers the antioxidant astaxanthin. This antioxidant serves as a natural stabilizer for the omega-3 fatty acids in krill oil, therefore no added antioxidants are necessary to preserve the oil. Astaxanthin is also gives krill oil its bright red colour! Click here to get to the whole story of Superba Krill Oil from catch to capsule. Would you believe that only about 2% of fisheries that support the long chain omega-3 business are considered in excellent standing? In that 2% is the Antarctic Krill fishery, from where Superba Krill oil is harvested. There are several independent expert organizations that can verify this sustainability, such as MSC, sustainable fisheries partnership and WWF. But Superba Krill decided to go a step further. While many omega-3 producers are sustainable, very few are also traceable. Consumers want to know where their products come from, and long chain omega-3s are no exception. 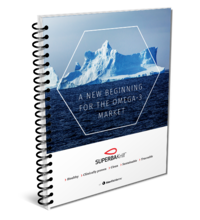 Aker BioMarine, the company that produces Superba Krill oil, maintains a 100% traceable supply chain that it also owns and controls. This means that you can trace the origins of the oil, as well as, have insights to its development all the way from sea to shelf. To sum this up; Superba Krill oil delivers omega-3s in an efficient way because the molecules are bound as phospholipids. Superba Krill ensures sustainability and full traceability of the products to meet the consumer's needs. 2. Ulven SM, Kirkhus B, Lamglait A, Basu S, Elind E, Haider T, Berge K, Vik H, Pedersen JI. Metabolic effects of krill oil are essentially similar to those of fish oil but at lower dose of EPA and DHA, in healthy volunteers. Lipids. 2011 Jan;46(1):37-46.